I have been meaning to write this soup up for quite a while. Since we cooked it again on Sunday (my bother in law, Greg came by for lunch), I had another shot at it. I think that one of the reasons that I keep forgetting to write something about this soup is that it is there really is nothing to making it. It is the sort of soup that doesn’t require an especially long cooking time or extensive preparation. Despite being very easy to prepare, you get a fine reward. 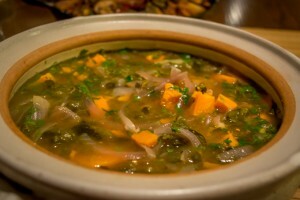 The roast chilies are accented wonderfully by the sweetness of the softened yam. There is a slight amount of heat from the chopped jalapenos and a wonderful tartness from the lime juice to clean things up. If you roast the chilies ahead of time in bulk, they freeze very well and will allow you to throw this together pretty much any time you want. I really like this soup topped with fried tortilla chips, but I realize that I am somewhat spoiled with a really nice deep fryer. They are totally optional and can be mad in a small wok with oil since you don’t need to fry up too many. Just make sure to get the oil heated to somewhere below smoking temperature and get the tortilla strips nice and crisp. One of the things that I really like about this soup (aside from the rich, bright flavor and satisfying thickness) is that the flavor profile goes with just about any other dish you should choose to serve. For our Sunday lunch, we served it with kefta, chicken emanadas, and a nice tapas of chickpeas and chorizo. Cornbread rounded things out. But heck, it would have been fine as a stand along or with a simple dinner of grilled chicken with salad. Looks pretty good too! In a medium sauce pan, saute the onions and garlic until softened. Add the broth and bring to a boil. Reduce to a simmer, add yams and cook until yams are softened; about 20 to 30 minutes. Add the chilies and simmer for 10 minutes to blend flavors. Add lime juice and serve. 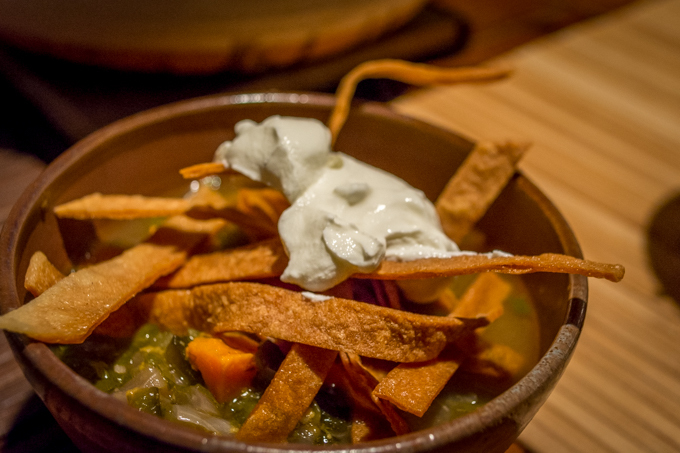 Garnish with cilantro, fried tortilla strips, and sour cream to taste.